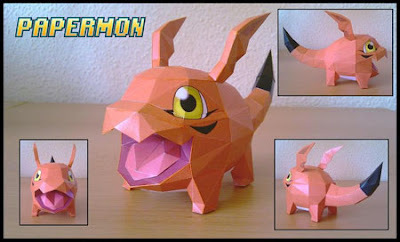 Gigimon is an in-training digimon who evolves from Jyarimon and into Guilmon. It sports a white belly, black-tipped tail, black markings near his eyes, the line's trademark wing-ears, and a face that has captured the hearts of many. This is one of the best-looking papercrafts from the guys at csfg. 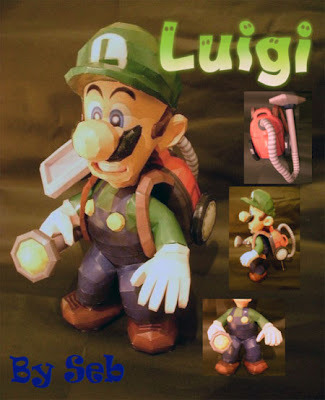 It's Luigi from Nintendo GameCube's action-adventure with his ghost-sucking vacuum cleaner Poltergust 3000. 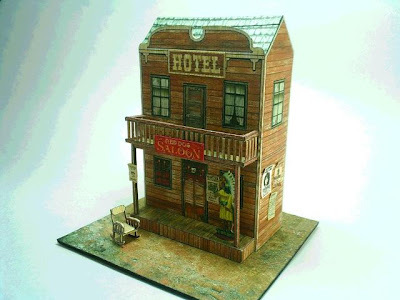 Model designed by Sebastian Zych. 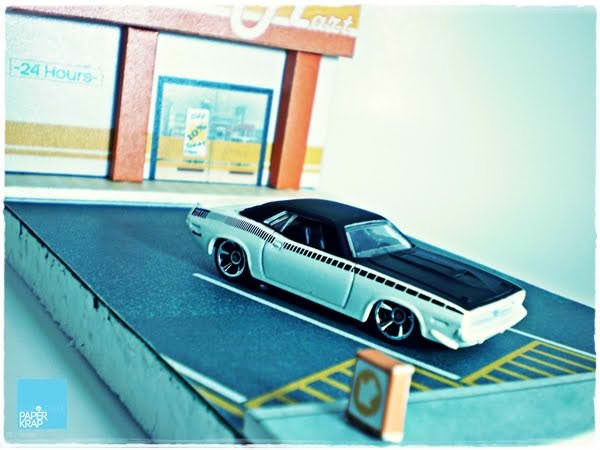 A 1:50 scaled sports car Lamborghini Gallardo LP570-4 Superleggera papercraft from the Indonesian designer Yudho. 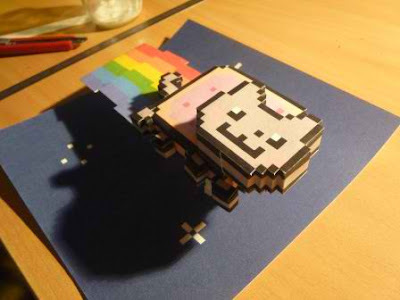 A papercraft tribute to Nyan Cat (also known as Pop Tart Cat), an internet meme, referring to an 8-bit animated gif of a cat with the body of a cherry Pop-Tart flying through space, leaving a rainbow trail behind the cat. Didier's calendar for the month of August features Jesus Healing Ministry. 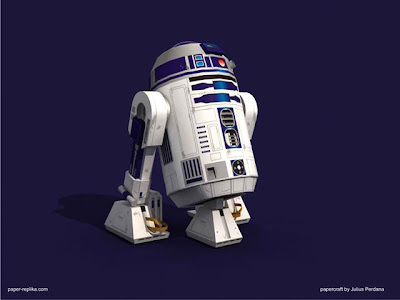 A much simpler version of Star Wars' R2-D2 papercraft with only 5 pages of parts from Julius. This Surfbot from Curiosity Group is ready to hit the waves this August! 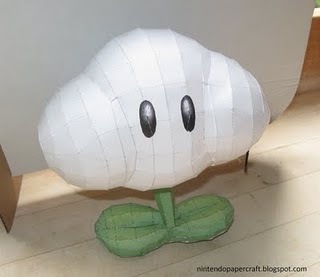 The Cloud Flower is a power up used by Mario and Luigi in the game Super Mario Galaxy 2 for the Wii. This power up enables to player to walk on clouds and create them in midair by spinning. It is the most common power up in the game. This model was made when I was thinking in those Zombie Movies, like 28 DAYS LATER or WALKING DEAD,when the survivors reach an abandoned cabin and prepare a kind of bunker to protect then against the zombie invasion. 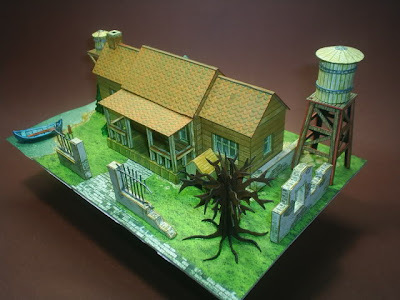 You can see there`s a dog house: a dog always alert about zombies in all movies. In the house they got a good provision of water and a little canoe, In the case of the zombies invade the house. 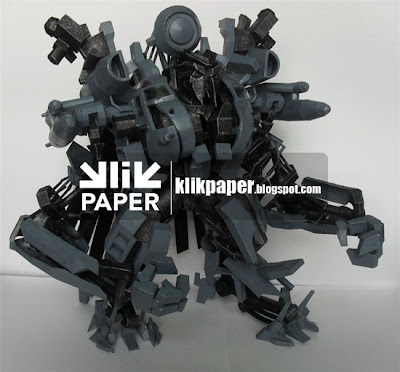 A Bartz Klauser papercraft wearing the DLC (Downloadable Content) costume for based on his Dancer sprite from Final Fantasy V.
I heard Captain America is good that's why I'm excited to watch it soon. 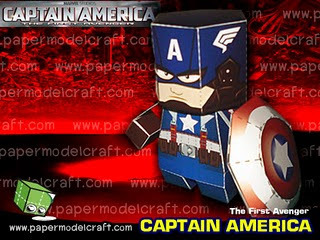 Anyways, here's another Captain America papertoy for all of you fans. Cylos is the leader of the Golden Frogs and lives on the Uncharted island from the Legend of Zelda Phantom of the Hourglass. 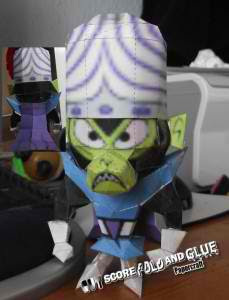 Mojo Jojo is the genius chimpanzee mad scientist Supervillain in the Cartoon Network's animated series Powerfuff Girls. 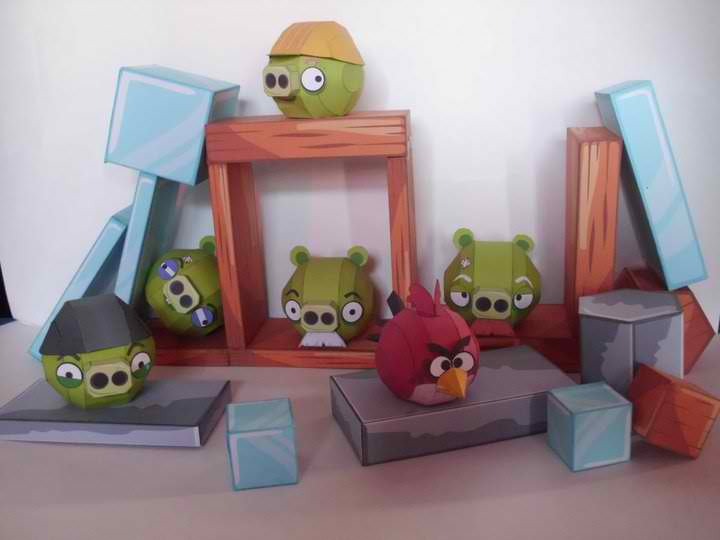 And after all the birds come the pigs. 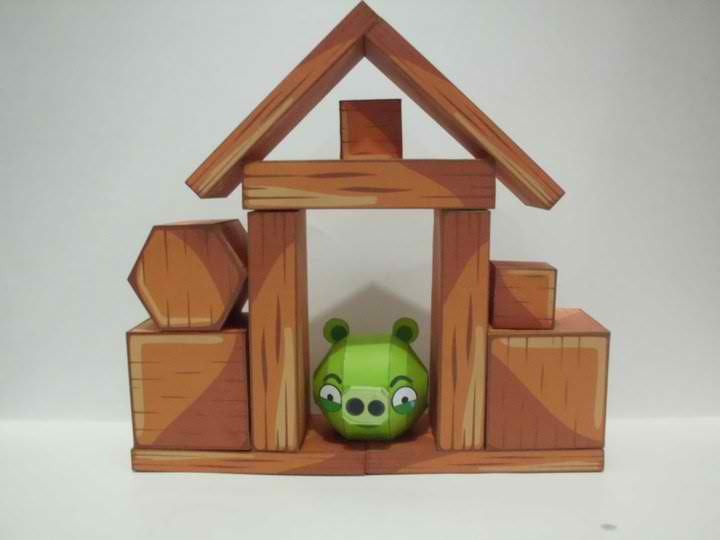 Cerebrave lets you design and build your own pig.There are lots of expressions available. Hopefully, the bricks will be released soon. Jo Dee's latest project is the 1:64 Mini-Mart diorama papercraft. 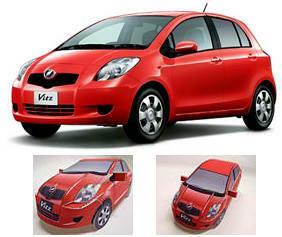 Its size is perfect to park those dicast cars. 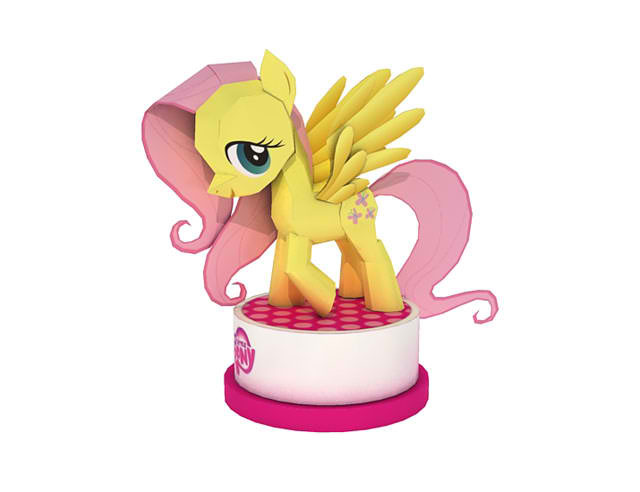 Fluttershy is a pegasus pony and one of the main characters in the My Little Pony animated series. 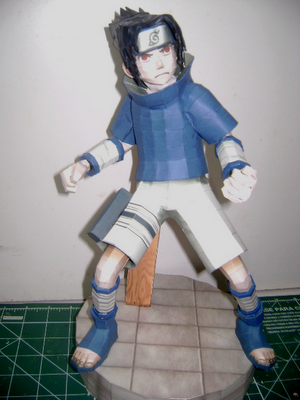 Sasuke Uchihais a main character in the Naruto series. He was originally introduced as a protagonist but later on became an antagonist. 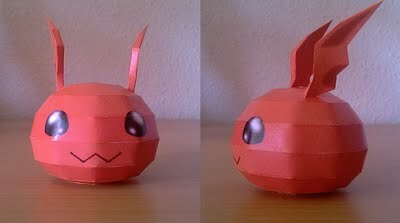 Nadask's latest papercraft is Saiyaman's helmet from the anime Dragon Ball. 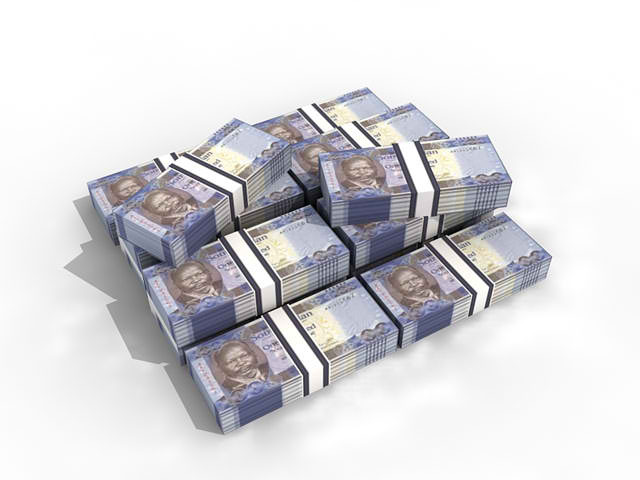 Check out the banknote of the world's youngest country, the Republic of south Sudan. It features John Garang de Mabior, the former leader of the Sudan People's Liberation Army. 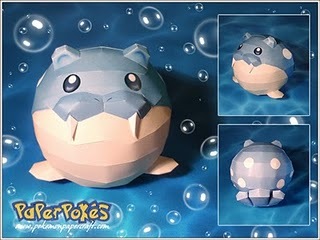 Spheal is a ice/water type Pokemon that closely resembles a baby seal. 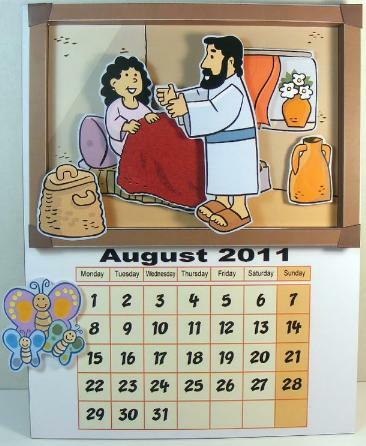 Ooh, it's Abe! He's definitely one of the most memorable characters in the PS1 games. 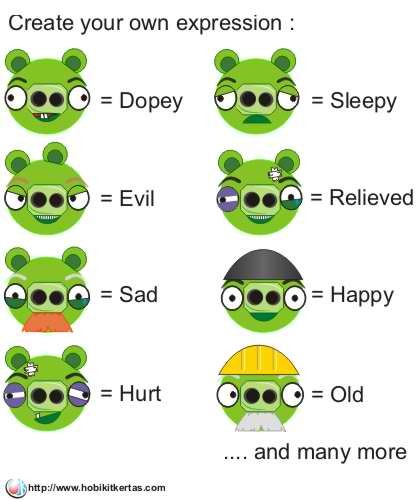 The Oddysee series of games center on the titular Abe, a Mudokon slave working at the Rupture Farms meat processing factory on Oddworld who tries to escape along with his fellow Mudokons. Blackout was a member of the Decepticon Destruction Team who can transform into a helicopter. He serves as the limb of the giant robot Bruticus Maximus. 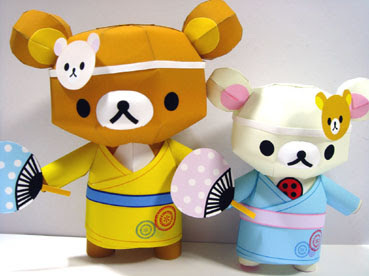 It's the Relax Bear duo in their Yukata outfit. As Miku Hatsune Vocaloid gained popularity, a demand for a male voiced Vocaloid grew. 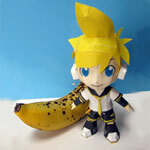 Hence, Kagamine Rin (female) and Len (male) were introduced. 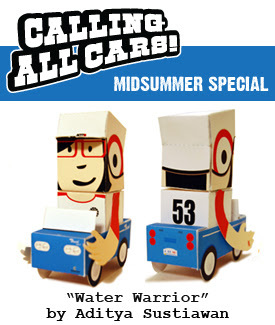 Horrorwood's Calling All Cars papercraft is brought back to life as Indonesian artist Aditya Sustiawan customized this awesome papertoy. 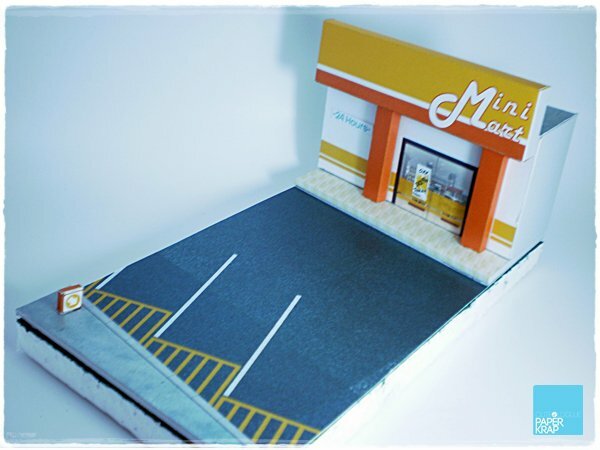 This papercraft set from Kirin was created to provide awareness for the Mark Bell Education Foundationthat seeks donation for the earthquake victims. 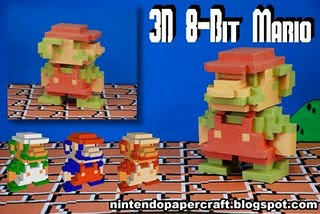 It's an 8-bit Super Mario papercraft based on the sprites from the original NES game, Super Mario Bros. 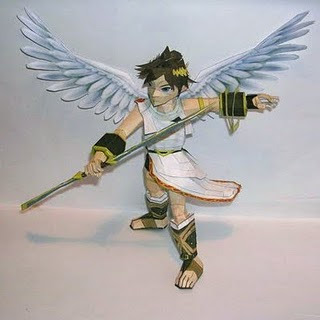 Pit is an angel from the mythical world of "Angel Land" from Nintendo's Kid Icarus series of video games. This one was based from a 3D model from the Super Smash Bros. Brawl video game. 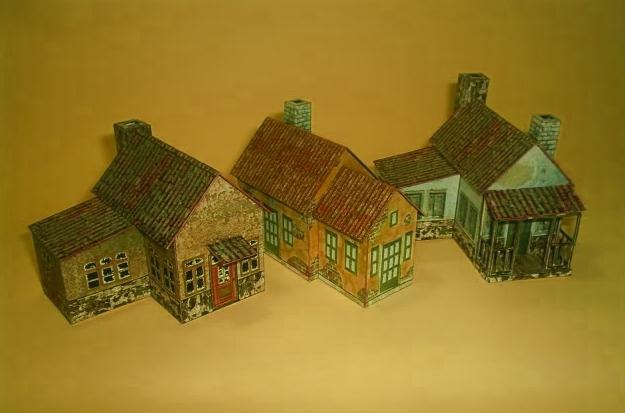 Three old coutry house papercraft from Mauther. 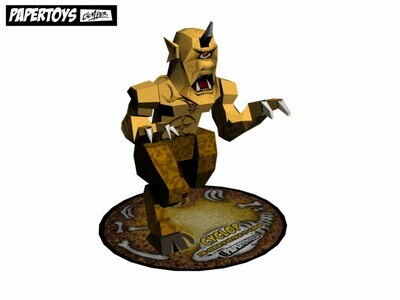 Ninjatoes' latest Lego papercraft brings back a lot of childhood memories. 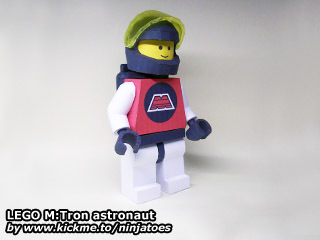 The M:Tron is one of my favorite space themed LEGOs back in the early 90s. New papertoy from Chris Ryan of Bamboogila's Corner. 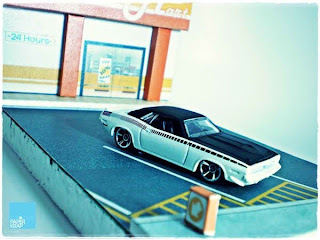 Meet Barry Barracuda, Nick Nite's Kujira customized by our friend Dolly Oblong. 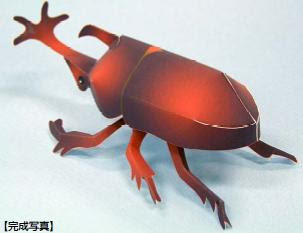 A papercraft beetle from kizuna-avenue based on the Japanese Rhinoceros beetle aka Kabutomushi, a species of rhinoceros beetle found in Japan, Korea, Taiwan and China. 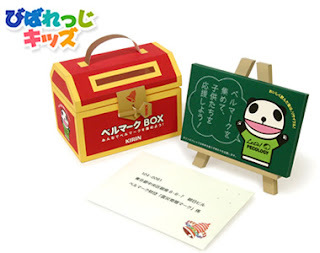 It is sold as a pet in department stores in many countries of Asia (in Japan, even in vending machines). 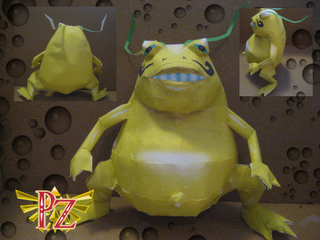 Jyarimon is a Slime Digimon whose name is derived from the onomatopoeia for crunchiness. 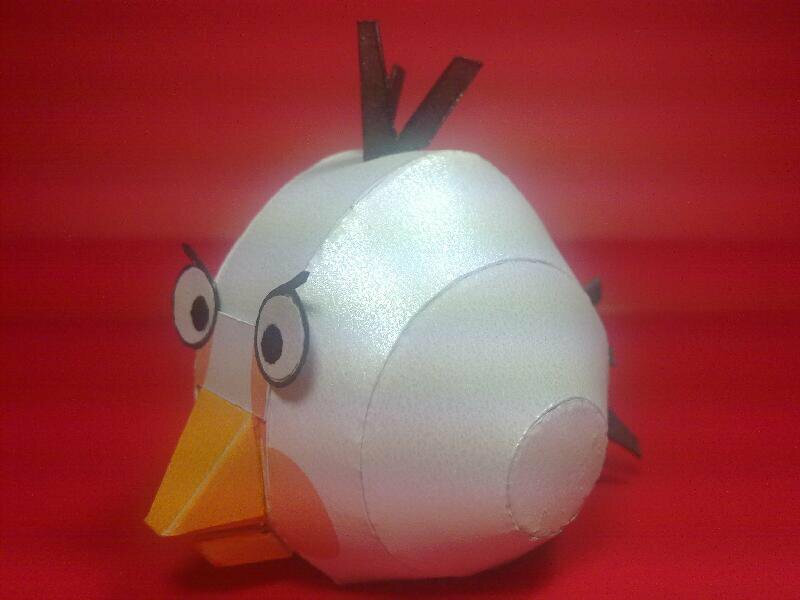 It is a Fresh-level digimon which evolves into Gigimon. 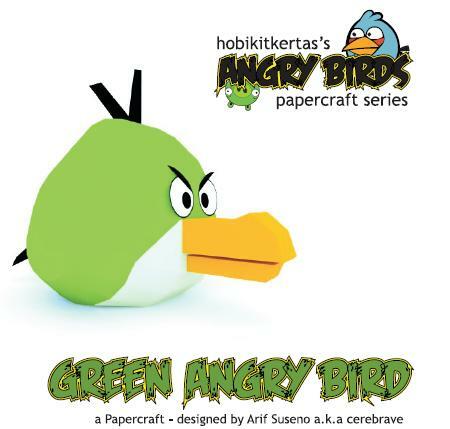 The green bird aka boomerang bird is the 6th model released in Cerebrave's Angry Birds papercraft series. As its name implies, its beak acts like a boomerang allowing one to do destroy hard to reach targets. Let's all head to the Wild, Wild West with Mauther's Red Dog Saloon Papercraft. 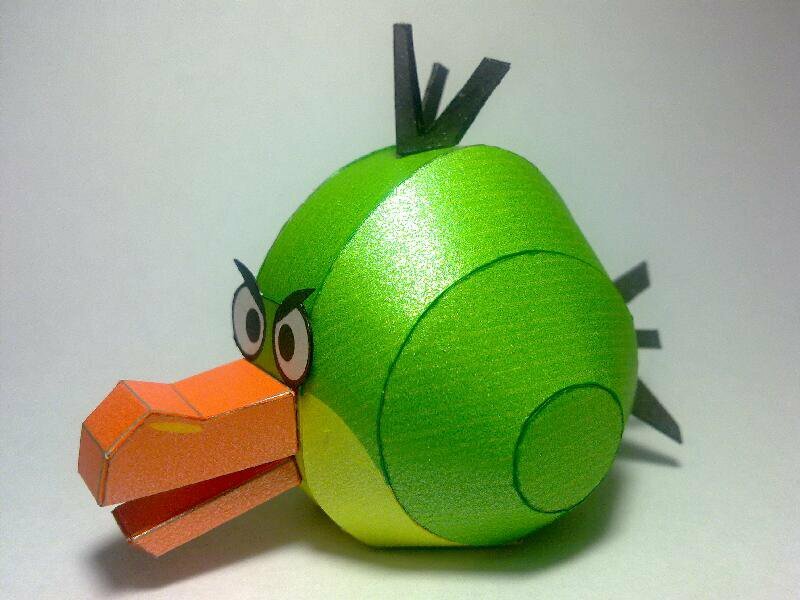 Here's the second version of Kain Highwind papercraft. 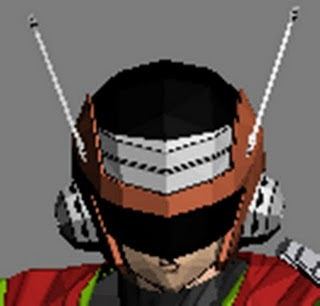 He's wearing his EX-Mode attire as seen in Dissidia 012 game. 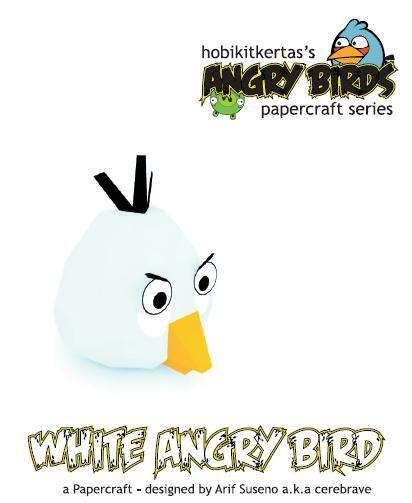 This white bird is the biggest one in the Angry Birds series. It's like a bomber that is capable of dropping an egg to the structures below its path. 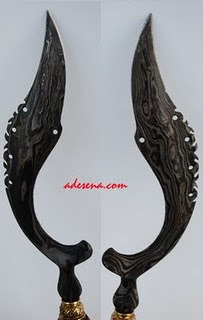 KUJANG is a unique weapon that originated from West Java, Indonesia. 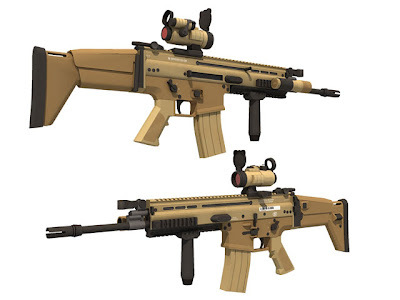 It is said to be a weapon of the peasants and was used in agriculture by the Sundanese. 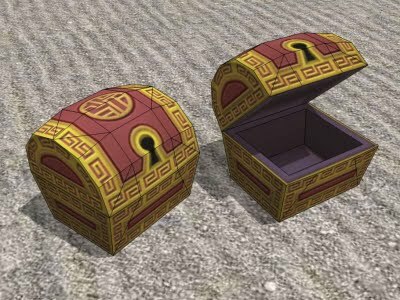 This month's offering at Tektonten's blog is the Kingdom Hearts 2 treasure chest papercraft found in the Land of Dragons area of the video game. Land of Dragons is based on the 1998 Disney movie Mulan.